This blog post will be a tour through our Steampunk living room. This project was started late in 2012 and reached this state of completion in mid 2017. The act of designing and building the components for this room has inspired me to get involved with making Steampunk/Teslapunk artistic creations. In these pictures we’ll start in the northeast corner and then swing clockwise through the room. Northeast Corner. Wood stove with quarter inch steel plate floor and faux rust back panel. Wood stove, another view of the steam gages on the left as well as the curtains to the outside patio glass door. Closer image of patent display and gauges. The large oak cabinet to the right is the entertainment center. The pyrometer (brass rectangular gauge) is actually set up to read out the temperature of the wood stove. Entertainment center with “map” door open showing the TV inside. The left copper counter weight for balancing the door is visible on the left. There is a matching weight on the other side. Entertainment center with “map” door closed, both counter weights visible. Base of entertainment center with doors for components visible. The glass windows allow for the use of remote controls for the sound system and cable box. Southeast corner. Entertainment center, speaker box on ceiling, hand lamp center, desk and blueprint on right. Close up of Steampunk speaker box. Steampunk mechanical hand lamp another view. Close up of antique hotel desk, steam engine blueprint and on the right a Steampunk lamp. Close up of antique desk with stool. Southwest Corner. Steampunk floor lamp and speaker box. To the right is the entrance French doors with curtains and illuminated cornice above door. Entrance French doors open, showing full length of cornice. French doors closed with fuller view of west wall. Close up of door handles on French doors fabricated from antique monkey wrenches. Northwest corner showing antique brass telescope and barrister book case. The final speaker box for the surround sound system is on the ceiling. Another view of the northwest corner. Teslapunk inspired spotlights made from antique “magic lanterns” are ceiling mounted. Close up of Teslapunk spotlights. North wall with glass doors leading to patio. Wood stove is visible to the left with steam gages. Steampunk floor register made from brass plate and antique brass clock gears. The clock key at the top opens and closes the vent. Close up of hand wheel door handle for patio glass doors. Patio doors with curtains closed. Top of entertainment center showing an antique (1920’s) “portable” radio and the mimeograph. I made the stand for the mimeograph and decorated it with antique gages, gears and lenses. Teslapunk desk lamp made from an antique electrical test box and a modern florescent sun lamp. The brass shade was fabricated from brass and copper plate. Small Teslapunk end table made from an antique kerosene heater and various other vintage and antique elements. The glass plates are custom cut tempered glass. Steampunk ceiling fan and light. This was actually fabricated from the old fan. Another view of the ceiling fan and faux rusted steel ceiling. Steel bracket detail on the entrance door. Matching brackets can be seen in the entertainment center pictures above. 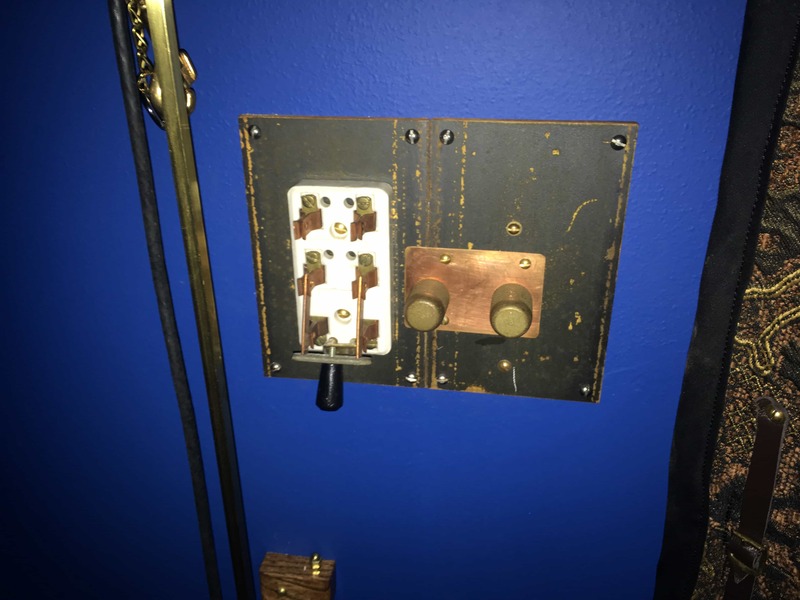 Teslapunk light switch with two dimmers. Wall plates were made from quarter inch steel plate and cut out on my milling machine.